Imagine a world where your credit card would not fit into every cash machine or where you could not just stroll into a shop and find the right light bulb for your lamp. A world without telephone codes, country and currency codes and access to the Internet. How would you know where a call came from, or how to reach a specific region? If we didn’t have standards, communication between people, machines, parts and products would be extremely difficult. For example, graphical symbols display important information quickly and clearly, no matter what language we speak or read – be they wash and care instructions on clothes, emergency evacuation signs, or electrical equipment instructions. But if everyone used different symbols for the same message, they would not serve their purpose! Technology also needs standards to communicate. Have you ever wondered how your computer sends your documents to a printer from a different manufacturer? Standards set out common rules and parameters so that products can work with each other. Standard file formats like MPEG and JPEG standard enable you to share videos and photos with family and friends using technology from different vendors. Now imagine how difficult it would be to order products and parts from international suppliers if we didn’t have standardized units of measurement. “Small”, “medium” and “large” mean different things to different people. Not only are standards good for trade, they also make it easy for people around the world to work together. International Standards are like the Rosetta stone of technology. They are essential for products to work together smoothly and for people to communicate easily. When standards are in place things just work, but if they are not used we instantly notice it. In a world without standards, routine activities we take for granted, like making a call, surfing the Web or using our credit cards when we travel, would be much more complicated, nearly impossible. 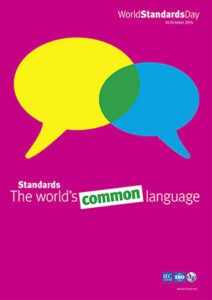 A team of 4 from Mexico has won the first prize in the #speakstandards video competition. Their video highlighting the importance of standardized graphical symbols in our daily life received half of the nearly 6,500 public votes. 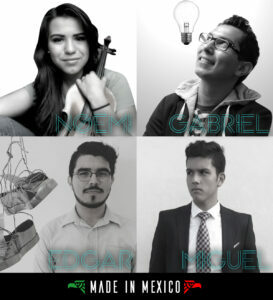 From left, clockwise: Noemi, “I enjoy coming up with ideas to make our work better and easier.” Gabriel, “I really like to think out of the box.” Edgar, “I love coffee, museums, opera and arts in general.” Miguel Angel, his mom is always joking about how he could be a model. #speakstandards challenged people to imagine how much harder life would be without international standards, and capture it in a 15 second video. The contest received more than 130 entries from around the world. Participants covered everything from clothing sizes, to interoperability of parts to efficiency and safety, and illustrated their videos with creative love stories, crazy scientists and a lot of humor. IEC, ISO and ITU selected the top 10 candidates and put them up for public vote. The clear winners were a Mexican team of 4 ranging from 30 to 15 years old. They include: Gabriel Enrique Hernandez Garcia, who works in the multimedia and innovation section of a certification body; Norma Noemi Herrera Ramirez a biomedical engineer; Edgar Antonio Hernandez Garcia, a graphic designer and Miguel Angel Romero Cortes, an enthusiastic teenager who loves playing soccer! In their video we see how without graphical symbols, communicating even the simplest messages, like which toilet to use or where is the fire extinguisher, would be much more difficult. This is because standards provide a common language that is understood everywhere in the world across geographical and language barriers. In second place is an Armenian team of coworkers from animation studio Orbeli Productions. They include 23-year-old Anna Sargsyan (founder), 19-year-old Shant Hakobyan (character designer), and 21-year-old Karo Galoyan (scene designer). Their video focused on the importance of standards for safety of products like lightbulbs. Anna saw the ad for the competition on ITUís facebook page, ì#speakstandards was our first international contest and therefore a big challenge. The subject was very practical, but also allowed for a wide range of ideas and creativity. In the end, we decided to focus on a simple example that even a child could understand. On third place is the first entry by the Mexican team of Gabriel Hernandez and Noemi Herrera which looked at the milk food chain and the importance of standards for ensuring quality and safety. It covers everything from animal feed, to farming, processing, packaging and distribution. On fourth place is a team from the Thai Industrial Standards Institute (TISI) which calls itself OMG Plus. Oh (40-year-old Ongard Jitprom) is a librarian, Mod (38-year-old Nathinee Chantajaru) is a foreign relations officer, Gap (39-year-old Narit Lerkmoung) is a standards officer, and Pae (58-year-old Varavute Eaimpituck) is an audio-visual technical officer. Their video tells a story about standards for Electromagnetic Compatibility (EMC) which are crucial in allowing us to use more than one electronic device at a time. “When we talk about EMC to consumers, many do not understand its importance. That is because they don’t realize that electronics and electrical devices generate unnecessary radiation which can cause interference when they are on at the same time,” explains the team.